Looking for something cosy and comforting for your daughter's room? 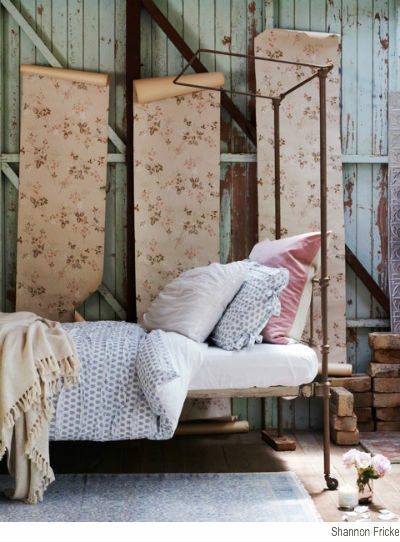 I thought this sweet country-style bedding from world's-loveliest-interior-designer-slash-presenter Shannon Fricke would look right at home on a girl's bed. It's more sophisticated than many offerings for kids and will take a tween girl right through the teen years. How gorgeous is the dusky pink velvet European pillow cover - just the right shade of not-too-girly pink and totally luxurious. I love this set teamed with floral wallpaper as Shannon has done here - and of course a posy of roses and a delicate tea cup would look perfect on the bed stand. You can find Shannon Fricke's latest 'From Dusk Til Dawn' bedding collection, rugs and homewares in the online store and at Domayne stores across Australia from May 2013. Thank you Shannon for sending this my way! Lovely to have you stop by. It's a pretty gorgeous bedding set! Sweet and sophisticated.